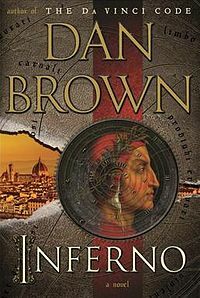 So Bad, I Read It For You: Dan Brown’s Inferno. I realize this new category of book review puts me at risk of seeming pretentious and huffy, but this book is a special kind of awful and deserves a special kind of review. Ordinarily, Brown’s faux history supports a fun series of twists and turns; sure, the writing isn’t all that great, but these books don’t ask to be taken seriously. Robert Langdon, Brown’s recurrent lead, is a delightful fusspot in his Harris Tweed, bragging about his eidetic memory, and spewing irrelevant historical tidbits so that the reader might see him as learned. Brown’s The Lost Symbol seemed a good indication that he’d lost his writing mojo, but I had to read Inferno. The Lost Symbol may have been awful, but I enjoyed Langdon’s romp through DC, a city I know well. With Inferno, I looked forward to Langdon’s investigation into a text I know well. So, I read it. And now: a Spoiler-Laden Review for the curious, for the people who want to know about the Big Dante Mystery without reading this book. Spoiler 1: There is no big Dante mystery. 1) It’s okay if a woman doesn’t appear svelte in baggy scrubs. 2) Since when is a ‘beauty mark’ a ‘blemish’? Anyway, Langdon looks out his hospital window and realizes he’s in Florence. He doesn’t remember why he’s in Florence, but he needs to move fast because a leather-clad chick with spiky hair has figured out his location. She storms into his room, shoots his doctor (the expendable one, not the hot one), but is unable to prevent his escape. The willowy doc turns out to be uncommonly strong as she supports the drugged-up Langdon to the street. They climb into a cab as its rear window is shot out and they speed away to Dr. Sienna Brooks’ apartment. At her place, Langdon reads some of her personal articles on the sly. He learns she has an IQ of 208 and can learn a new language in a month and a half. How? Her cerebellum is special. (Really.) There’s an accelerated cellular growth in her brain, like cancer, except it fosters advantageous growth. This will be mentioned ad nauseum, but wait!–the beautiful doctor is bald! She leaves Langdon in the other room to pull off her wig and stare at her bare scalp in the mirror, the tears welling in her soft eyes. Does her gift have an unexpected downside? Meanwhile, a yacht is floating around the Adriatic by direction of “the provost”, the leader of the enigmatic Consortium. We learn that the provost never lies to a client. Like ever. Whatever the client asks: it’s done. No questions. But a man is looking at a video left by a client that is supposed to be uploaded tomorrow. The man is questioning the bizarre video that shows an underwater cavern with a plaque inscribed: “In this place, on this date, the world was changed forever”… the date is tomorrow. Seasoned Dan Brown readers know what this means: the chase is on! Cue lots of running around Florence. Langdon and Sienna are chased by a drone (an awesome, 3-foot long remote-controlled helicopter (I’d like one, please)). They run through museums to consult various artworks. As Langdon took a ‘secret-passages’ tour years ago, they are able to run through tunnels around/in/under/over the museums. There are even tunnels that ARE museums. This allows Langdon to impart a variety of half-baked history lessons as they flee. His lessons make the running seem less urgent; his running makes the history seem slapdash. There’s no winning this one. They eventually meet another guy, Ferris, who claims to be on Langdon’s side, but he’s got some kind of horrible rash on his face with bleeding pustules and a black mark spreading from the center of his chest. He reassures Langdon that he’s totally fine. Just allergies. No biggie. We learn that a man, Bertrand Zobrist, hired the Consortium to provide cover while he developed a super-secret plague. He antagonized the leader of the World Health Organization (WHO) and she (Elizabeth Sinskey) has been looking for him. The projector that is now in Langdon’s possession was sent to her by Zobrist as a taunt; she hired Langdon to help her crack the code to learn how the plague would be dispersed before Langdon was shot. Turns out, the SWAT-ish team is under her direction and Langdon needed to NOT run from them. Ooops. Before his death, Zobrist placed the plague in a water-soluble sac and suspended it over the plaque in an underwater room. He recorded the video (the weird one given to the Consortium) to tell the world what he had done and why. You see, he believes that overpopulation is the greatest threat to world health and that overcrowding leads to poverty, poverty leads to desperation, desperation leads people to steal/kill for resources. This is the connection to Dante: Zobrist aims to turn the world from desperate sin to salvation. When the sac dissolves, an unknown virus will be released into the water and spread worldwide. Langdon and Sienna get split up and Langdon finds himself with the SWAT-ish team and the WHO leader, Sinskey. By this time, the Consortium has figured out that they backed the wrong client (Zobrist) and decide to help clean up the mess. Now everyone is on the same side: The Consortium is no longer enabling Zobrist and so they show his yet-unreleased video to Sinskey and Langdon. They’re all going to work together… but without Sienna. Why? SHE WAS ZOBRIST’S SECRET LOVER. Oh, and she’s not sick: stress makes her hair fall out. We learn that way back before the story began, Sienna contacted the Consortium to protect Zobrist. He developed the plague and the trail of clues for Sinskey to find Ground Zero (he wanted her to be the first to visit after the virus was released). Eventually the Consortium contacted Zobrist and when they searched his house they realized he had created something contagious. When they found him, he ran and jumped to his death. When Sinskey learned he was dead, she pulled strings to access his safety-deposit box and find the projector that was meant for her. However, she got to it before the Consortium was going to deliver it, so the always-listen-to-the-client-Consortium freaked out and labored to get the projector back. When they learned Langdon had it, they sent the motorcycle chick for him. Her name is Vayentha and she was never going to kill him, because her gun only contains blanks. When she caught him, the Consortium didn’t know how much Langdon had been told by Sinskey and they worried she would learn the location of the Zobrist’s work and destroy it (at the time, they didn’t know the scope of it)… so they did some weird science-y mumbo-jumbo to give Langdon amnesia to keep him from helping Sinskey. Then they simulated the hospital scene. (No joke.) His stitched up head injury was a small laceration they themselves made to simulate his being grazed by a bullet. When Vayentha stormed the hospital room, she was shooting blanks. The doctor shot in the opening scene had a squib under his clothes. By having Sienna save Langdon, they were able to pull him to their side and win his trust. The taxi was theirs too (with the back window set to blow out); the call to the U.S. consulate was made with a number Sienna gave him that really went to the Consortium and they sent Vayentha… see how this all fits together? Ya think? Anywho, the bruising on his chest was from the squib shifting before it went off–it broke one of his ribs. So what about the plague? Langdon/Sinskey/Consortium race Sienna to the site and find the little sac too late. It’s dissolved. The plague has been dispersed. They run tests and everyone is infected. Sienna escapes and Robert gives chase. Turns out that the date given on the plaque was the projected date for global saturation. Due to Zobrist’s brilliance, pretty much everyone has it. I’ll admit: this surprised me a little. But…what’s the catch. Why is no one sick? Langdon struggled to grasp her meaning. This virus changes our DNA? Did you guess it? It’s a “sterility plague”! Now, don’t panic. It’s “randomly activating” so even though it’ll be carried by everyone on earth, not everyone will be sterile. Here’s the best part: nobody in the book cares! Oh and, Sienna, when she was racing them to the virus wasn’t actually going to disperse it. She wanted to get there first to keep this sort of technology from the WHO and world governments so it could never be weaponized. Since Zobrist was the only one who could create such a thing, no one is able to create any kind of cure. Especially since tweaking the DNA back to normal could have all kinds of unintended consequences if they got even the smallest thing wrong. So Sinskey and Sienna go off to hold conferences and tell the world what’s up. And this does kinda help the overpopulation issue so… no one is really all that upset. Before she leaves, Sienna kisses Langdon because why not and then he goes home. He gets his regular Harris Tweed suit back and his Mickey Mouse watch and things are normal again. Except for the sterility thing.